Livermore, CA - Livermore has become increasingly popular as a destination to the flying community with its Municipal Airport conveniently located near major business centers, an award-winning wine region, and popular shopping, dining, and recreational areas, as well as for its convenient access to the greater San Francisco Bay Area region. Thanks to the efforts of Five Rivers Aviation with the support of the City of Livermore and over a dozen community organizations, the Aircraft Owners and Pilots Association has selected Livermore, CA as the location to host thousands of pilots and their families from all over the country for its 80th Anniversary Fly-In on June 21 and 22, 2019. Held annually, hosted at various airports throughout the country, the Fly-Ins bring in both enthusiastic aviators and non-pilots interested in aviation as well as offer a variety of activities to the general public such as seminars, trade show-style exhibits, and festive outdoor entertainment. Having released an RFP, the AOPA is soliciting bids from local vendors to help host an event of this size with services related to traffic control, event equipment, and catering. For more information about AOPA Fly-Ins, visit www.aopa.org/fly-ins. The Aircraft Owners and Pilots Association is the largest aviation member association in the world, effectively advocating for our members and the general aviation community on a variety of legislative, regulatory, and airport issues at federal, state, and local levels. AOPA is consistently engaged in improving general aviation safety, growing the general aviation community, and promoting membership engagement and involvement through a variety of aviation events and initiatives. Five Rivers Aviation is a family-owned Fixed Based Operator (FBO) at the Livermore Municipal Airport and provides corporate hangars, aircraft ground services and visitor accommodations, supporting the aviation and local communities. Five Rivers offers flight training scholarships for young aviators and has used a number of these hangars for school district charity events and large youth STEM programs. 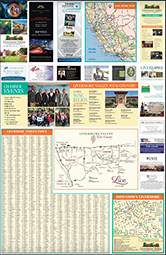 The Livermore Valley Chamber of Commerce is a membership organization representing businesses and organizations from every sector of the economy. Its mission is to enhance the business environment and quality of life in the Livermore Valley through innovation, leadership, visionary programs and powerful connections.